We’re sure you’ve noticed, but we’re going to say it anyway — traffic is getting awfully congested. This isn’t only a headache, it’s causing us to spend more time and money behind the wheel. Officials with the Texas A&M Transportation Institute (TTI) recently completed the Urban Mobility Report (UMR) to look into just how serious the problem. Drivers don’t know how long it’s going to take for them to get to where they need to be as travel times can oftentimes be unpredictable. But researchers now have a way to measure that degree of unreliability. It’s the Planning Time Index (PTI). What it does is help you figure out how long you’re going to need to get there. If the Index tells you the trip is 3.00, that means that you need an hour for a trip that is normally only 20 minutes. The PTI ensures on-time arrival 19 out of 20 times. Our Boston car accident attorneys understand that this traffic tracker is looking at common congestion times and traffic rushes. Officials have looked at traffic patterns and have determined where the bad traffic is and when it comes and goes. Boston ranked up there with the country’s most congested areas. We were on top of that list with Seattle, Philadelphia, Chicago, Atlanta, Houston and Washington D.C. According to the report, the average commuter in Boston spends about 52 hours in traffic jams. This means that we’re spending about 26 more gallons of gas in traffic than the average commuter. Using gas and wasting money to sit in traffic? Sounds crazy! By better planning, you can use less travel time and save money! The PIT for our city is 4.00. That’s not good at all! We have a 4.0 but it’s not good! In addition to predicting travel time, the Report also estimated the carbon dioxide (CO2) emissions resulting from these delays. Totals say that there were more than 55 billion pounds of CO2 released into our atmosphere because of vehicles sitting in traffic. “It points to the importance of implementing transportation improvements to reduce congestion,” says co-author and researcher David Schrank. 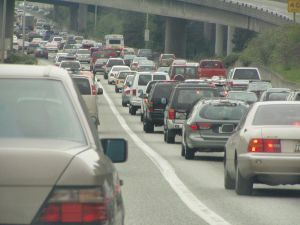 Officials think that the congestion and the traffic is only going to get worse as the economy improves. The report estimates we waste close to 3 billion gallons of gas, or enough to fill the New Orleans Superdome four times — while waiting in traffic. This means that drivers lost more than $120 billion just sitting there waiting. We all know that the traffic can be frustrating. We’re asking you to keep your calm. As it can be aggravating — we’ve all been there — planning ahead can help to relieve your anxiety. Be safe out there, check traffic reports before heading out, stay off of busy roadways and keep your calm behind the wheel. Remember that we’re all in this together. If you or a loved one has been injured in a car accident in the Greater Boston area, contact the Law Offices of Jeffrey S. Glassman, LLC for a free consultation. Call 1-877-617-5333.